I'm so happy to be blogging today. A friend of mine from my old neighborhood sent me an email asking me where I've been the last couple of days on the blog. I felt so loved ;) Thanks, friend. I've been busy getting my girl's birthday together and we didn't even have a party! Tuesday I completed the pre-birthday duties (making treats for class and getting some favors, decorating her door at 1030 at night and wrapping gifts, etc. etc). Wednesday I sent her off to school with her treats and favors. While she was in school my youngest and I met a friend and her kids for a bagel then went to a place called Firezone for an hour. It was fun, but cost an arm and a leg. An arm and a leg to me is anything over $5. These days, every kid place you go to costs at least $10. Sheesh. Anyway! It was a fun hour. Any child that loves firetrucks, wants to be a fireman or likes creepy dummies named Timmy would love it. I'll explain. There was a set called "Timmy's house" and it was "on fire". They had smoke coming out and you were supposed to go in and rescue Timmy. I tried to get Drew excited about saving Timmy from his bed. We ran in, and there is a freakishly scary looking boy dummy laying in the bed with his mouth open. I was even a little scared to rescue Timmy who clearly looked like the fire had already done him in. Drew stared at Timmy's face for what seemed like 5 minutes and then looked at me and said, "I don't want to save Timmy!" and ran out. Drew steered clear of Timmy's house after that. I didn't take a picture of Timmy, but found one online. FREAK-Y. One of the gifts I had given Miss was a sewing kit for kids. She always asks me if she can help me sew, but I'm too scared to let her sew on the machine. This little kit seemed perfect, although I thought it may have been a little too hard for her. 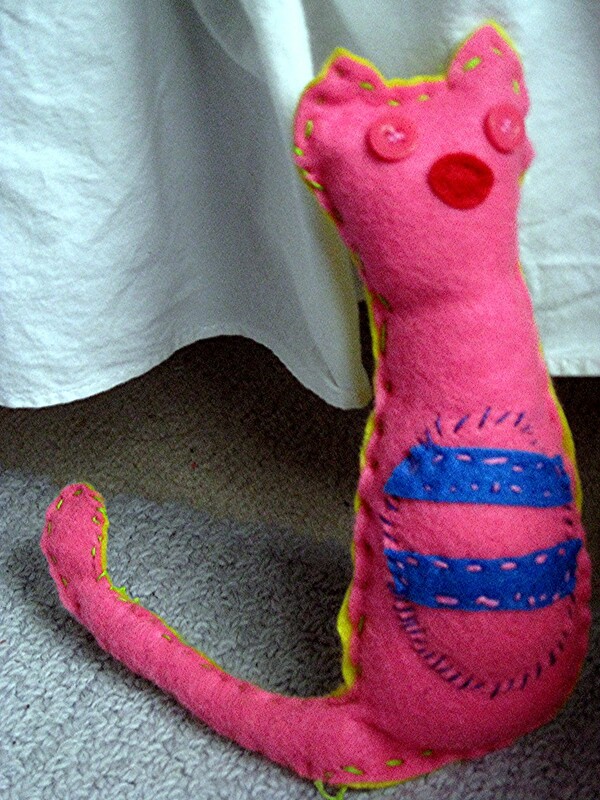 The first thing she wanted to do when she got home from school was to make the stuffed kitty for grandma. Grandma and grandpa were coming over for dinner. So we spent an hour on it. Then, we all took naps (ahhhh) and got back to it feverishly so that kitty would be done by the time grandma came. I would push the pin up from the bottom and she would push the pin down from the top (she was afraid she would stab herself). We took turns and it was a long ordeal. When she wasn't looking, I would sew 4 or 5 stitches to make it go a bit faster. Although I didn't think we could do it, we finished! Check out Miss' first sewing project! Didn't it turn out so cute? Per the birthday girls request, we had breakfast for dinner. Specifically, toast, eggs and bacon. Grandma and grandpa brought their newest addition to their family over. Jinky the Yorky. Cute. Ella is a faster sewer than me! =) Go Ella!! Timmy is seriously scary! Poor Drew... scarred for life! I love the kids sewing kit idea, I wonder if they make those a little less pink? Asher loves all things hands on and is very interested in my sewing machine. Love the Kitty project and so would my girls! Due to my lack of sewing talent, we've only done the knot projects (totally fun). Sounds like the Birthday Girl had a great day. Happy 5th Birthday Ella!